Still Need Help Filling Out Your Bracket? With the start of March Madness looming tomorrow, the sports writers here at Onward State have decided to show you our brackets and give you our "expert" advice in case you're still trying to settle what teams you have going to the Final Four. And just a spoiler alert, after getting robbed of a bid to the big dance for the second year in a row, Penn State will not be one of those teams. I try to follow college basketball all across the nation in my spare time. Going home over Winter and Spring Breaks allowed me to watch some teams that I would not normally see here on campus (Thank you, DirecTV). Even though I have always followed the regular seasons closely in years past, it has never transferred to success in picking a bracket. But, in any case, read on for a few observations I've made that might help you out. 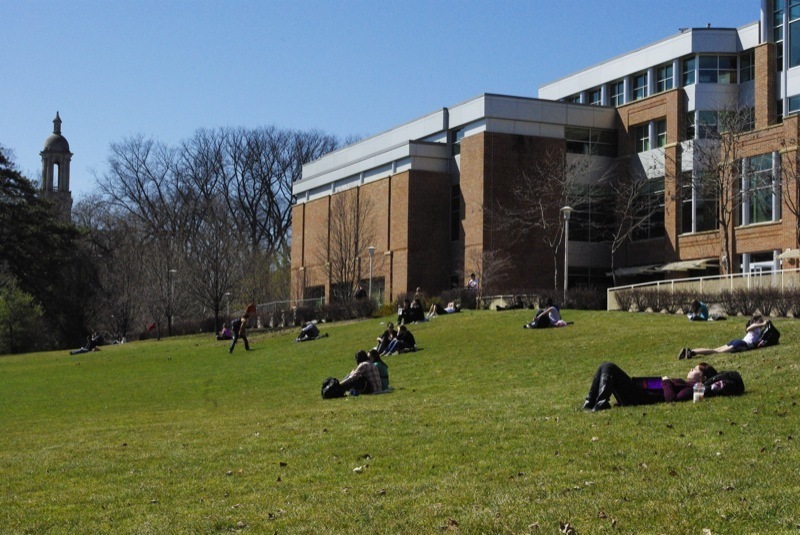 Students, having emerged from a winter that saw many a cutely-named snowstorms, are enjoying one of the best times in Happy Valley by studying on the HUB lawn. The recent state problems with funding have led to an increasing number of people who are alarmed at where the university's future is going, including Penn State. But if there's one thing that has come out of it, ironically, is that some students are getting more experience than they would if the state did know how to properly manage its funds. If there's only one thing that college students hate besides a shoddy Wi-Fi connection, it's messing with their money. We don't have much, and what we do have must go towards books and bar tabs. But when it happens, we tend to act, sometimes by rallying, sometimes by holding our buildings hostage. The following is the former. Read on to learn more about Capital Day. Should SCASD Align Its Spring Break with PSU? 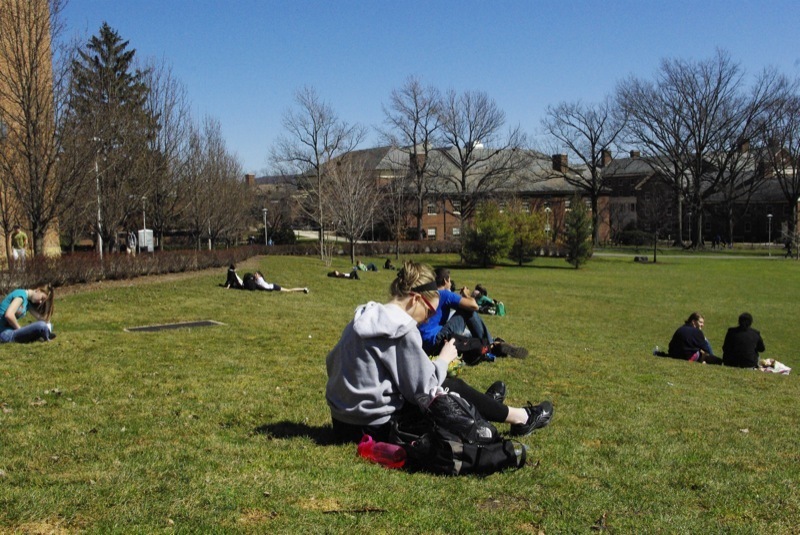 With last week's Penn State spring break, students were able to put down their textbooks and take a break. However, it seems that relaxation was contagious. For many years, the State College Area School District had its spring break aligned with Penn State's, but this year things were different. The two breaks only partially aligned. The Centre Daily Times reported that from Wednesday to Friday last week between 17 and 19 percent of students at State College High School were absent, more than 3 times the average rate. With approximately 12 percent of students filling out educational trip forms to explain their absence, the halls of State College High were 450 people emptier than usual. The school district was expecting this, though perhaps not to the degree it actually happened. With so many faculty children and siblings of Penn State students in the State College Area School District, families had been complaining for months that they would be unable to use spring break to vacation together. Is Penn State Too Student-Friendly? Jeff Kern of the CDT seems to think so. In his most recent column, he suggests that, like a good parent, Penn State needs to crack down on its wayward charges. Apparently Penn State has been codling students, reducing 8 a.m. classes and allowing 21-year-old students to have alcohol in their dorms. A former Borough Council member, Mr. Kern cares about the State College community, and in the wake of recent events, he has decided Penn State needs to start punishing its student body for their bad behavior. Forget the fact that a majority of these students do not engage in risky behavior, you have to go after the whole lot to get your message across. College should be like work, Mr. Kern suggests. Make classes early and mandatory, just like the office work week. Keep students who can drink legally from having alcohol in their dorms, because that will keep the underage kids, who are real problem, from drinking. To delve deeper into the underlying motions and teaching of golf, the Golf Teaching and Research Center opened last November. The GTRC uses motion-capture technology to accomplish this task. You can saunter down to 5 Keller and don one of these motion-capture suits once reserved for the likes of movie productions with multi-million-dollar budgets and Tiger Woods having his swing captured for use in EA Sports' golf video games bearing his name (mistresses sold separately). Read the full post to find out some of the more intricate details of this system.